From the right vantage point on The Outer Banks — like the high sand dunes of Jockey’s Ridge State Park in Nags Head, or the Wright Brothers National Memorial in Kill Devil Hills — you can watch the sun rise and set over water. You can fish, fly, surf, sail, act like a pirate (minus the pillaging), dive, or splash in the waves. You can find a deserted stretch of beach on the country’s first national seashore and play Robinson Crusoe for the day…or you can just sit and let the waves and the currents carry your worries away. 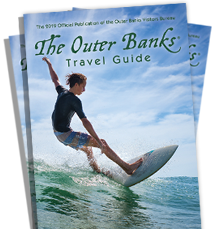 The bottom line is this: There are more outstanding things to do on, in, and over the waters of The Outer Banks of North Carolina than we know how to count — but here are eight of our favorites. 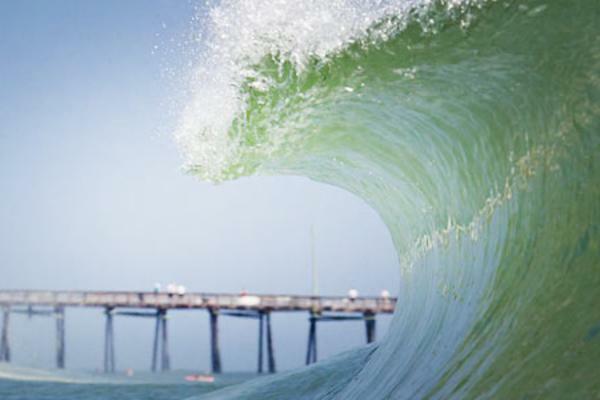 REAL Watersports, in the appropriately named village of Waves, is the center of water-based action sports on The Outer Banks — enthusiasts come here for gear, grub, and a place to stay. 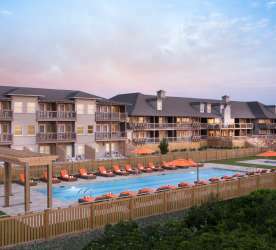 Watermen’s Retreat, their on-campus condo, makes for a full-service surf camp and a 24/7 immersion into the OBX lifestyle. The waves here bring consistent breaks where beginners can learn the sport and experts can still find challenges. Non-surfers stay busy, too: Want to take advantage of the constant wind and miles-wide Pamlico Sound? Try kiteboarding. Want something calmer? Head out into the sound on a stand-up paddleboard. But if you’re looking for something no one else does, REAL has foil boards. Think a surfboard (or wakeboard or kiteboard) with a hydrofoil mounted on the bottom. 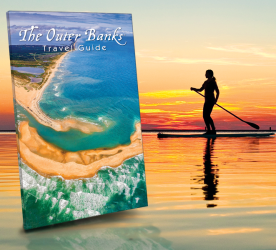 It’s challenging and fast and definitely needs to be on your OBX list. Kitty Hawk Kites also runs surf lessons for all ages and groups along the length of The Outer Banks. 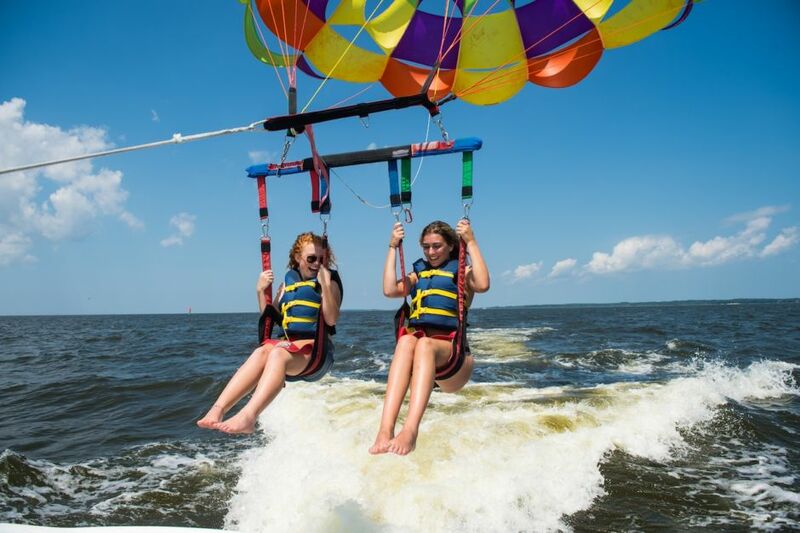 When you’re tired of the surfboard, they can put you on a hang glider, a stand-up paddleboard, a kayak, or in a parasailing harness…but, sadly, you can’t fit 10 people underneath a parasail. But not just any pier. Jennette’s Pier is a LEED Platinum pier (with geothermal capabilities and three wind turbines) that marries next-generation environmental technologies with the design and feel of historic Nags Head. Outer Banks residents and visitors have been fishing here for 75 years. If you don’t want to try your cast, walk out past the breakers and watch surfers ride waves, take photos of someone’s catch, or just grab a spot and watch the clouds drift by. Jennette’s Pier is part of the North Carolina Aquarium system, so look out for educational and interactive environmental programming throughout the summer. There’s a sizable aquarium in the pier house as well, giving you a much closer glimpse of what’s right under your feet. If you want a deeper look at all the wildlife that lives under the waves, head to the North Carolina Aquarium on Roanoke Island. Here you’ll find the largest group of sharks in the state (dive with them if you’re certified), a touch tank filled with stingrays and horseshoe crabs and starfish, displays on wetlands, and even another (smaller) pier on the sound. Kids love it for sure, but adults take note: It’s an air-conditioned break where you’re sure to find that enviable Instagram shot. But with sea turtles, alligators, jellies, and those sharks, you’ll probably like it as much as the kids anyway. We’re also talking 2018 — water-powered jetpacks, hoverboards, and Jetovators have replaced the biplane. 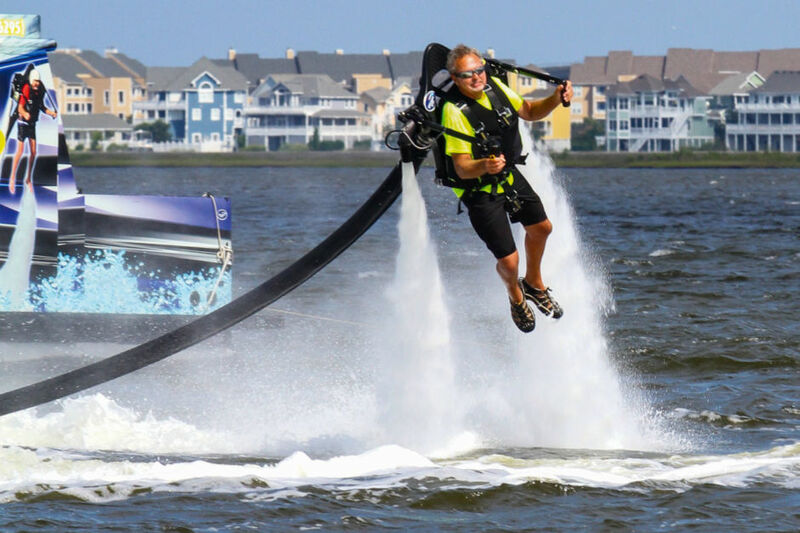 They all use high-pressure streams of water to give riders the power of flight in ways the Wright brothers never could have imagined (Kitty Hawk Kites rents JetPacks and Flyboards). And if you need a tamer (though still awesome) version of flight, there’s always parasailing. On the inland side of Albemarle and Pamlico Sounds lies the Alligator River National Wildlife Refuge. It’s an immaculate swath of forest, marsh, and creeks where a 2.5-hour kayaking trip barely seems to dent the amount of landscape you’ve explored. At the turn of the 20th century, this area was dominated by a logging camp and moonshine stills. Today, it’s all about the wildlife: alligators (naturally), bobcats and beavers, black bears (yup, they like living on the coast, too), and even red wolves. Bring your camera, plenty of water, some bug spray, and you’ll be set. Charter fishing is big on The Outer Banks. Whether you want to go out to the Gulf Stream and hunt for tuna, grouper, or sailfish, or stay closer to shore and fish the sounds for drum, flounder, or trout, there’s a guide who can match your skill level and angling desires. Because buying dinner is the cheater’s way out. Of course, there’s also good fishing from Jennette’s Pier or just walking out to the shore and fishing in the surf for flounder and Spanish mackerel. All you need is a valid fishing license (some charters take care of this for you) and gear (again, charters will set you up, but you can rent or buy rods, reels, and tackle all over The Outer Banks) and you’re good to go. Okay, you’re probably not going to set sail to the Caribbean or Europe, but you absolutely can sail around the sounds or go offshore for a pleasure cruise, sunset sail, or sailing lesson. Downeast Rover combines sightseeing, wildlife spotting, and a touch of Outer Banks lore on their soundside sails. 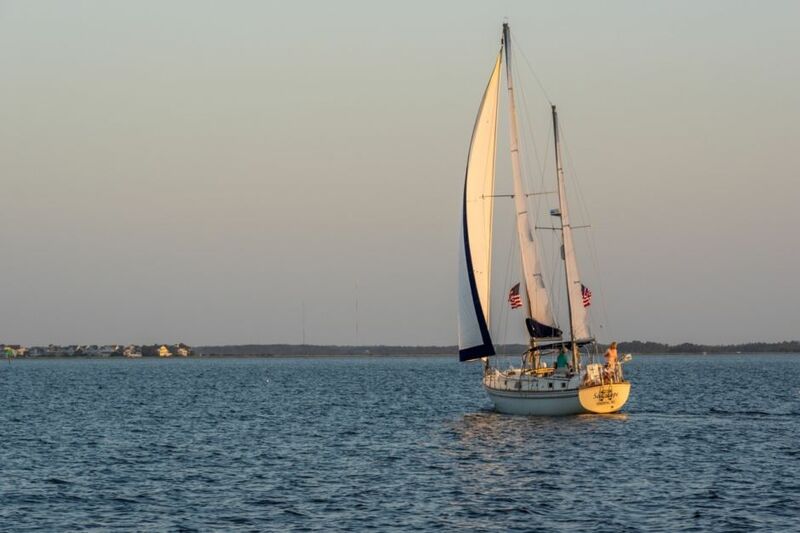 Sail Outer Banks takes small groups (up to six guests) on trips along the sound (and you’re welcome to bring a cooler and some food aboard). And Sail Stiletto puts you on a fast boat for a high-performance sailing experience that matches pace with the rest of your trip. You didn’t think this was going to be one of those beach vacations, did you?